The status of many carnivore populations is of growing concern to scientists and conservationists, making the need for data pertaining to carnivore distribution, abundance, and habitat use ever more pressing. Recent developments in "noninvasive" research techniques - those that minimize disturbance to the animal being studied - have resulted in a greatly expanded toolbox for the wildlife practitioner.Presented in a straightforward and readable style, "Noninvasive Survey Methods for Carnivores" is a comprehensive guide for wildlife researchers who seek to conduct carnivore surveys using the most up-to-date scientific approaches. Twenty-five experts from throughout North America discuss strategies for implementing surveys across a broad range of habitats, providing input on survey design, sample collection, DNA and endocrine analyses, and data analysis. Photographs from the field, line drawings, and detailed case studies further illustrate on-the-ground application of the survey methods discussed.Coupled with cutting-edge laboratory and statistical techniques, which are also described in the book, noninvasive survey methods are efficient and effective tools for sampling carnivore populations. 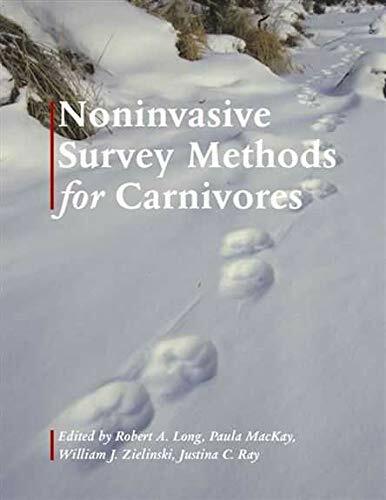 "Noninvasive Survey Methods for Carnivores" allows practitioners to carefully evaluate a diversity of detection methods and to develop protocols specific to their survey objectives, study area, and species of interest. It is an essential resource for anyone interested in the study of carnivores, from scientists engaged in primary research to agencies or organizations requiring carnivore detection data to develop management or conservation plans. "The book will be useful to anyone interested in the study of carnivores, including scientists engaged in primary research, as well as agencies and organizations requiring carnivore detection data to develop management or conservation plans." "For such a technical publication, the language is refreshingly free of jargon and technical terms. Highly recommended." "The bulk of the volume and the detailed explanation of both the theoretical underpinnings as well as practical field considerations in the use of the techniques will be much appreciated by researchers who consider using these methods." "This collection is a comprehensive guide for wildlife researchers, who seek to conduct carnivore surveys using the most recent scientific approaches."